Top Shelf has already celebrated the Dark Empire Sourcebook as one of West End Games’ best sourcebooks and an excellent entry point for the fan interested in gaining familiarity with the roleplaying game sourcebooks. The sourcebooks WEG released for Timothy Zahn’s Thrawn trilogy, however, may be an even better introduction to the sourcebooks for the beginner. Rich in Expanded Universe lore, they flesh out Zahn’s trilogy with backstory and background information vetted by Zahn himself, providing an excellent avenue for those familiar with the Thrawn trilogy — and who isn’t? — to dip their toes in the sourcebook pool, while offering much to the experienced fan as well. The West End Games sourcebooks are worth exploring for anyone interested in the Expanded Universe — ultimately, they’re the foundation of it. Though the books, comics, and Ewok paraphernalia produced around the movies are the earliest Expanded Universe material, they were largely ignored during the Expanded Universe boom of the nineties. It was WEG’s Star Wars roleplaying game, produced after the films concluded in the eighties, that began the task of building a systematic Expanded Universe, a dense web of background information, in the pages of its RPG sourcebooks. When Timothy Zahn kicked off the EU renaissance, he used the sourcebooks as reference material, building on an existing base. 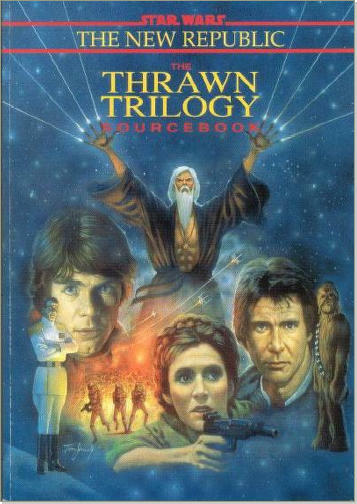 West End Games returned the favor by releasing sourcebooks expanding on each novel of the trilogy; the three were later collected in The Thrawn Trilogy Sourcebook, with relatively minimal cuts to the collected material. With this sourcebook, you’ll never be lost inside Mount Tantiss again! As sourcebooks do, they expand on the characters, locations, events, and organizations of the trilogy, rendering these books vital resources on that period of New Republic history. The books include profiles of all the major characters and many minor characters who would never otherwise be fleshed out. 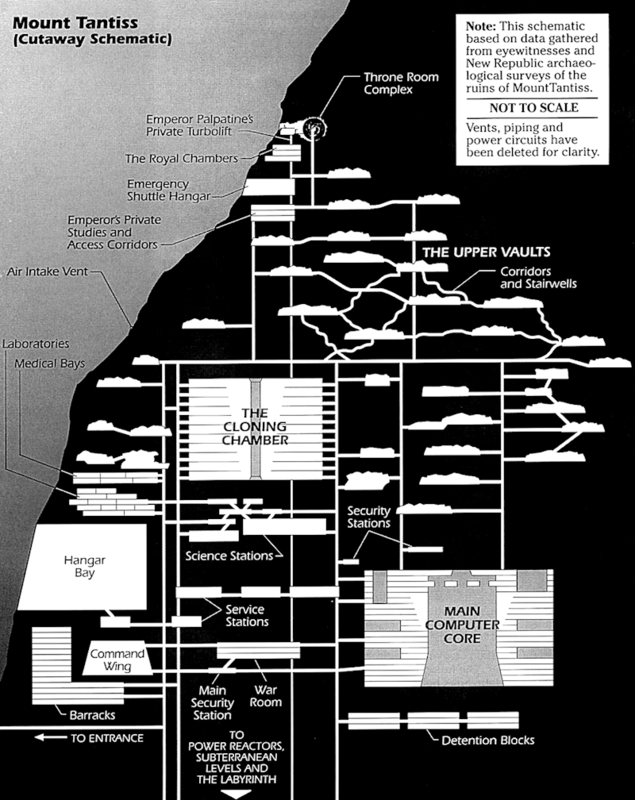 If you want to learn General Covell’s story, or the background of the many members of the Smugglers’ Alliance, this is the resource for you. Similarly, you can learn about new species hailing from the planets Zahn mentions, and learn those worlds’ histories. Weapons, technology, ships — the full details are here. If you like Golan Battle Stations, check the sourcebooks for more. If you want to know how the New Republic’s government works and who its leaders are, that information is inside. There’s even an explanation of the rules of sabacc. There’s hardly anything that appears in the books that you can’t learn more about from the sourcebooks, and the details are always fascinating and enlightening. But there’s more than just expanded writeups on offer. Vignettes offer narratives that go beyond the books. Do you want to read the moment Garm Bel Iblis left the Rebellion? It’s there. When Grand Admiral Thrawn first made contact with Pellaeon? There. In-universe news reports from Ukio during Thrawn’s conquest? There. In-universe documents like that are common. A full reproduction of the Declaration of a New Republic includes the signatures of the New Republic’s leaders, while an oral account from Admiral Ackbar recalls the creation of the B-wing. There are writeups of battle tactics complete with diagrams. Maps show the layout of Karrde’s base and other settings. Gorgeous illustrations of events, people, locations, and items grace the sourcebooks’ pages. In short, no matter what kind of fan you are, there’s something that will appeal to your sensibilities. The appeal of these sourcebooks, though, is not simply their information-density. The appeal is that they’re good. They are well-written, well-conceived documents that tell interesting stories, build fascinating background, and enrich the Star Wars universe. These were designed to provide facts with which roleplayers could create their own storylines set in the universe, and as a result they’re perfectly crafted to stimulate the imagination, to create a fascinating world, rich in detail, in which the reader’s mind can dwell. More than anything else, WEG’s sourcebooks convey the sense of living inside the Star Wars galaxy, and the Thrawn trilogy sourcebooks are great examples of that phenomenon. Packed with information of all kinds and designed to engage imaginations, these sourcebooks are perfect for anyone who wants to explore the Star Wars setting. The fact that they build on the best-known Star Wars novels makes them an ideal entry point for anyone interested in looking into Star Wars’ sourcebook offerings.